A pleasant and very spacious apartment formed from the ground and lower ground floors of a large house and located in a hill village above Bagni di Lucca. 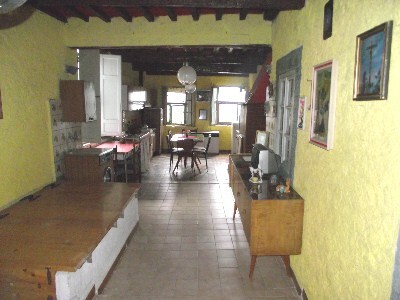 On the entrance level is a very large rustic living room/kitchen, with working fireplace and painted beams. 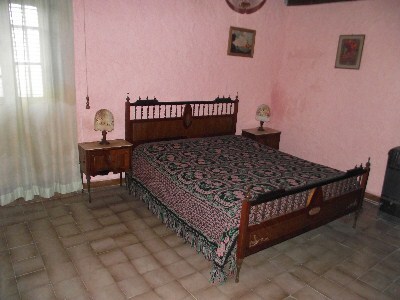 Also on this level are two double bedrooms, a large single bedroom, and a bathroom with shower. There is a view over the tiled rooftops to the wooded hills beyond. The rear part of the kitchen is a later addition to the house and, if required, this could be removed and part of the space reformed into a roof terrace which would provide a small amount of external spaces and views over the surrounding countryside. Lifting a trapdoor reveals stairs that lead down to an arched area below. that provides the "cloister" that give the house its name. From here are reached three large rooms, similar in size to those on the floor above, antique stone arches, a wood fired bread oven, old cotto tiles, and chestnut beams. Steps from here lead down to a further basement room with a low ceiling suitable as a store room. This additional space could be converted into extra day or night areas, or simply left as it is. 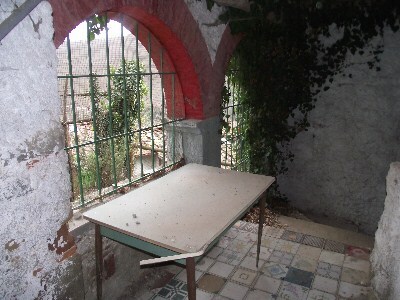 The living space of the house is habitable but in need of some modernisation and redecoration.